Raw Blue has been skirting the edges of my consciousness for awhile now. I knew it was a debut novel. I knew it was written by an Australian author. And I vaguely knew that it wasn't really available here in the states. But I wasn't really interested until a few days ago, when for some odd reason I started investigating it seriously. I'm not sure what made me do it. All I can say is, I saw a reference to it somewhere and I got a feeling. You know what I mean. So I went on the hunt. As far as the cover goes, well, I'm not wild about it. I like the title font and color just fine. But nothing about the rest of it reels me in and, having read it, this neither looks like how I picture Carly, nor does it really capture the many complexities of what is going on in this novel. But. As I looked into tracking down a copy, I remembered I'd read very positive reviews on several of my favorite sites, and after checking out Kirsty Eagar's site, it quickly became clear that my best (and fastest and cheapest) shot would be downloading the eBook and going from there. So I did. And, wowzers, am I glad! Carly is 19. She's on her own. She dropped out of university awhile ago for reasons both complicated and painful. She lives in a messy apartment, which she shares with a Dutch woman named Hannah. She works nights as a cook at a somewhat dicey cafe. She avoids answering calls from her disapproving mother. But most of all--Carly surfs. She lives to surf. Eats, sleeps, and breathes the sport. And she has very carefully arranged everything in her life to accommodate that one pursuit in the hopes that she'll be so absorbed in it, she'll never have to think about what happened to her two years ago. And life is . . . well, if not precisely stimulating, it's her life. And as unbelievably private as she is, Carly is comfortable with the way things are. Until she meets Ryan--another avid surfer who starts showing up at Carly's favorite spot. Ryan is older and seems to have a slightly checkered past. But he seems genuinely interested in Carly. He's quiet and not intimidating. He loves the sport she lives for. And gradually she begins to wonder if it might be worth responding to one of his many offers of friendship. If she might be ready, finally, to not be alone anymore. At the same time, Carly runs into a quirky kid named Danny. Danny is fifteen and has synesthesia, which means he sees people as colors. For reasons passing Carly's understanding, this young kid latches onto her, and suddenly Carly has two people trying to be her friend, to claim pieces of her heart. We're still sitting there when my mobile starts ringing an hour later. I decide to leave it, thinking it must be Emilio. So I get up and run inside--leaving a phone ringing is the sort of thing that messes with Hannah's mind. The phone dies as I pick it up and I check the menu for missed calls. It wasn't Emilio who called, it was Ryan. I wait to see if the message icon comes up, but it doesn't. What to do? Maybe my board's ready. Maybe he wants Hard Cut back. Maybe curiosity is killing me. He answers on the first ring, which sort of jolts me. There's a pause long enough to be filled in with static. 'Been getting out much?' he asks. Another long pause. The air feels heavy. I put the mobile down and rub my face. I feel like my stomach's dropping away. And that's that, then, I think, walking towards the deck. Before I get there my mobile rings again. 'So, it's me again--Ryan.' His voice is different this time, not as brisk. 'Um, yeah.' Coastalwatch has been going on about nothing else all week, sounding like the voice of doom: If you want to live, do not venture out on Sunday. He stops talking as though he's waiting for something. I'm quiet because I'm not sure if he means I should go with him. I'm not sure what he means at all. 'Okay.' I would like to ask for some clarification, but I don't have the guts. He hangs up before I can say okay again. I blink at her, surprised. She's right. My happiness is crunchy. Snapping, crackling and popping in the sun. I think that passage gives you a feel for Carly and Ryan and the halting way their relationship begins and progresses throughout the novel. I fell for them both immediately. Kirsty Eagar does such a fine job of pacing the story and allowing the reader to really take the time to get to know Carly, her past, and what makes her tick, before introducing new characters and new elements. The result was that I was thoroughly on her side for the long haul. And it should be pointed out that this is not an easy story to read. It is definitely for the more mature reader of YA, as the language, tone, and subject matter are all quite gritty and not for the faint of heart. I, for one, loved it because the characters were a bit older, definitely more in the New Adult region. Carly's out of high school, done a stint at college, and is living on her own and holding down a job. Ryan is a few years older at 26, and he has seen his share of life as well. It's refreshing to read about characters in this particular stage of life. 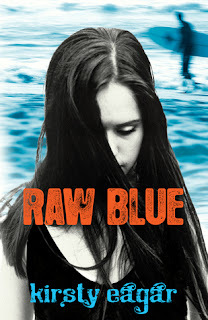 Raw Blue is painful, dangerous, beautiful, and wonderfully romantic all at the same time. For the space of time I was reading it, I, too ate, slept, and breathed surfing. I was with Carly every step of the way, and I was incredibly satisfied with the ending she carved out for herself by the skin of her teeth. Definitely one of the best reads of my year so far. I am thinking that buying the e-book and reading this on my computer is the way to go because I can't handle reading all these amazing reviews and not being able to read it. just that passage alone and the words you have used to describe this book make me want it so very badly!! As ever, fabulous review. I need to buy this! This is the fourth rave review I've read of it. Great review. I've been pining for this one since I read Kirsty's second book Saltwater vampires. Oh, I am so jealous! I've been dying to dead this! I featured this as a Want Books pick a few weeks ago, but hadn't taken they plunge with the ebook option yet. Maybe I will splurge and buy a hard copy instead. I had a feeling you would love this. I asked a friend who went home from Australia to get this for me based on Aussie book bloggers' recommendations and I'm glad I did. Otherwise, I'd probably be pining for it by now. I hope it gets a US publisher soon. :) I loved that this one is more New Adult than YA, I want to read more books that fall under that genre. What is this "New Adult" genre? Methinks I would like it. And now after having read that passage, I want to use Australian lingo. And I wish it would be summer already. your review just completely NAILED it! i especially was nodding along when you mentioned Ryan and Carly's relationship. it really gave me knots in my stomach. I love when you get so passionate about the books that move you like this one did. It's been added to my list.